A little saying that every bride would have heard before her day. It’s an old English rhyme dating back to the 1800’s, giving advice on what a bride should wear. It originally had a last line of ‘and a silver sixpence in her shoe’ , which has been lost with time (thankfully so – can you imagine how uncomfortable that would be?). Where to start – ‘something old’ – may be a little tricky if you are planning on buying everything shiny and new for your wedding day. Perhaps look at it a little differently – not ‘something old’ – but something you already own and love. For me, it was my standard, every day pearl earrings which I love and a beaded clutch which belonged to my gran. Both I already had, and loved and it was a welcome piece of familiarity on a day which is filled with everything new. Whether it’s a brooch or earring, these are fairly easy to incorporate into your outfit – a brooch can be pinned to the ribbon of your bouquet – the same for earrings, if you aren’t keen to wear them. You can even use one as a hair clip if you are wearing your hair up. 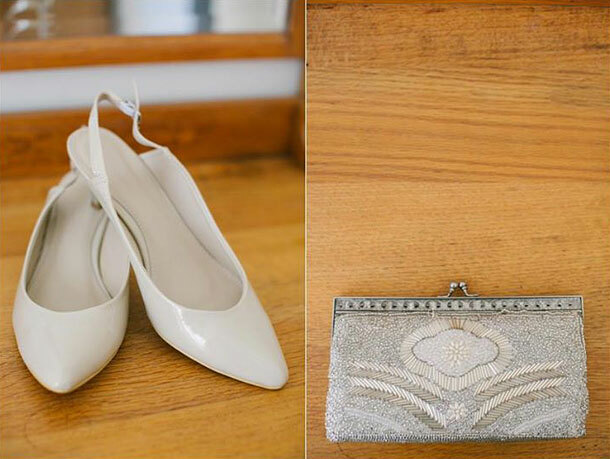 Not an obvious one – but if you have shoes that you love, which are comfortable (no blisters or pinched toes on your wedding day) and beautiful, then there’s no reason not to wear them. If you don’t happen to have a perfectly vintage wedding dress lying around, you can still sew a small piece of one of your mom’s (or grandmother’s) dresses inside yours – a little reminder that only you’ll be aware of. If their dress (or veil) had lace trim, that is an even easier option to include.